Home » Posts tagged "garments buyer list bd"
Now Bangladesh is one of the largest RMG exporters serving in the world. In recent time, Bangladesh is developing their apparel sector. Top garment buyers of Bangladesh; RMG (Ready Made Garments) buyers of Bangladesh are mainly from USA, UK, Canada, Australia, Switzerland, Italy, France, and from entire Europe continent and many other countries. Bangladesh apparel industry is growing so rapidly because of a lower cost of production as the cost of labor is cheap here and with the capacity to produce quality goods. We have acquired the expertise to produce according to the buyer’s demand around the world that’s why our market demand is increasing day by day. Because of easier communication system buyers from the European countries contact with garment product sellers and they get a quick response as we have higher interest to serve the buyers according to their demand. 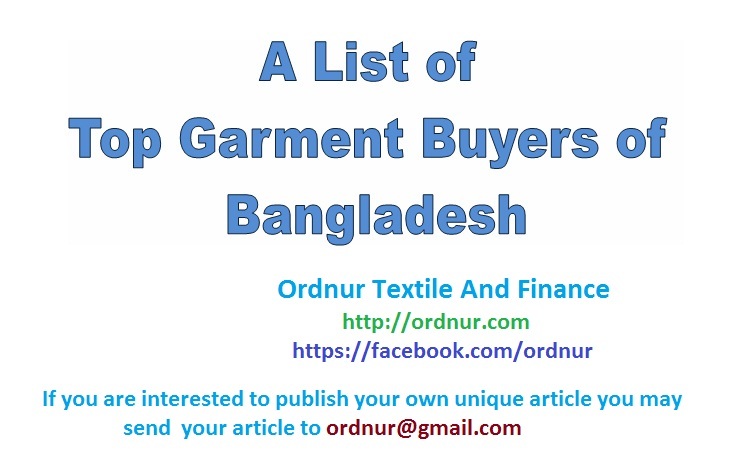 I have tried to make a list of top garment buyers of Bangladesh so that you can get the idea of who are the main buyers of garments. This article will be helpful for the merchandisers or any other person who is interested to engage in garments export. If you are a merchandiser of the local or multinational company located in Bangladesh then this will definitely help you to get the buyers name and contact them. So that you can increase your customer’s basket which will ultimately help your company to increase their total export earnings. If you know other than these buyers name then please let us know through your valuable comment. We are eagerly waiting for your response. Hope this article will enrich your knowledge about who are the top garments buyers of Bangladesh.